The vOICe translates live views from the phone's camera into sounds that you hear via the phone's speaker or headset, thus targeting sensory substitution applications for the totally blind, and even synthetic vision. Once started, The vOICe Android will continuously grab and sound snapshots from the camera. There are no connection costs while using it, because The vOICe Android runs off-line. Each camera snapshot is sounded via a polyphonic left-to-right scan through the snapshot while associating height with pitch and brightness with loudness. For example, a bright rising line on a dark background sounds as a rising pitch sweep, and a small bright spot sounds as a short beep. This approach allows for sounding arbitrary images while largely preserving the image content as needed in sensory substitution for the blind. · Added new gesture-based touchpad interface for Google Glass (swipe support; see support web page for details). Added "record audio" permission for dialog-less voice command support on Google Glass as well as on phones/tablets. · Emergency fix for Google TalkBack Explore-by-Touch mode no longer working on The vOICe main screen (caused by preparations for Google Glass). · Say light level, in lux, when pressing capital L. Improved support for low resolution screens (240 x 240 for ZGPAX S5 smartwatch). Added protection against overheating: app quits when device gets too hot. Fix in explore-by-touch emulation and scanline timing for sighted users. · Further accessibility improvements. Added touch controls on main screen for blind photography. Workaround for TalkBack volume key issue. · Fix for talking compass not working on some devices (HTC One M8). Cosmetic changes for some screen resolutions. Fix for focus issue. · Minor bug fixes in launching external apps. · Fix for ZXing barcode scanner no longer returning search results. Tweaked UVC camera support. · Fix for Android bug that caused The vOICe to quit after about a thousand soundscapes. · Added alternatives for the Menu button, giving improved compatibility with Android 4.0 through new Options button on Action Bar, or using a tap at the bottom middle of the screen. · Performance improvements and minor bug fixes. · Added "Explore by touch" accessibility support for the graphical main screen under Android 4.0. · Fixed a Proguard bug by reverting to older version. · Prepared for Android 4.0. Added support for floating point hardware (armeabi-v7a). · "Help on keys" menu item now offers an accessible and clickable list of keyboard shortcuts. Ads disabled for Android 1.6 to prevent crashes. · Multilingual support added for Korean. Minor bug fixes. · Multilingual support added for Simplified Chinese. Added continuous autofocus support for Android 2.3 (Gingerbread), with distance indication on suitable devices. Added x86 native code support. Improved orientation sensor code. Refined contrast enhancement. · Multilingual support added for English, German, French, Spanish, Dutch and Russian. Speech rate controlled with up/down keys on main screen. · Added user-defined shake actions. Fix for space bar speaking full location only once. · Support for IDEAL Item Identifier added. · Bug fix for stack overflow crashes at top and bottom of main menu. 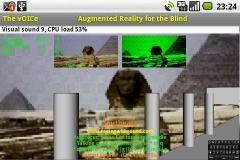 · Now fully prepared for Android 3.0 (Honeycomb) including its "holographic" UI; bug fix for crashes on non-ARM CPUs. · Experimental touch screen exploration mode added (default off, under Other settings). · Improved compatibility between volume key navigation and touch navigation in dialogs (trying to avoid need for double-touch). Less chatty locator (by default). · Extended torchlight support with manual toggle. Full screen option added. Bug fix in ad support. · Support for barcodes and QR codes added. ·Improved soundscape quality (16-bit, and better stereo separation). Minor fixes.